Conservative MP Rob Nicholson speaks outside of the House of Commons in Ottawa. OTTAWA – Conservative MP Rob Nicholson is spreading the word about a pocket-sized measure that could help prevent or stave-off heart attacks, following the sudden death of one of his caucus colleagues. 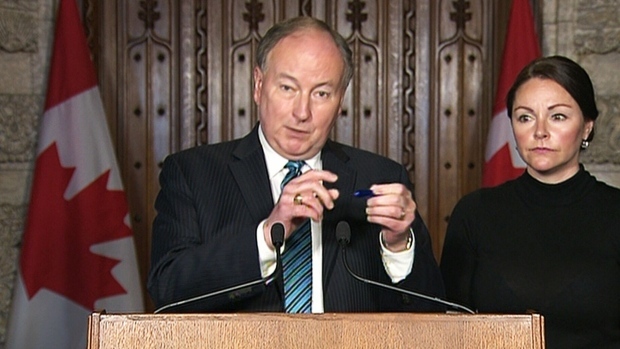 Speaking to reporters in the House of Commons foyer Wednesday, Nicholson held up a little blue pill case that attaches to a keychain, where he said he keeps "a couple of Aspirin" tablets, and now so will many of his colleagues. The pill case is something Nicholson said he has kept with him for some time, but after Ontario Conservative MP Gord Brown’s sudden death earlier this month, he was inspired to spread the word. Nicholson went online and ordered hundreds of the keychain cases and has since been passing them out. He estimated each one cost around a dollar. "I thought to myself, it would be appropriate to, in memory of my colleague Gord Brown that I do something like this… I’ve been giving them out to my colleagues, to people I know," Nicholson said, accompanied by Brown's wife, Claudine Courtois. Brown's death hit Parliament Hill hard. An MP since 2004, he died after apparently suffering a fatal heart attack in his Parliament Hill office at the age of 57. 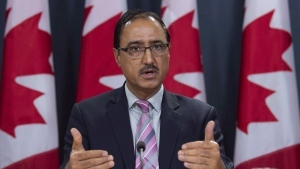 "I'm going to make them available to people in my constituency and for those who are here on Parliament Hill, if anybody wants one, please call my office or drop by my office," Nicholson said. Citing the recommendation to chew a few low-dose aspirin tablets if you think you may be having a heart attack, after calling 911, Nicholson said having some handy can’t hurt. In 2014 Health Canada gave Bayer Inc., the makers of Aspirin, the okay to promote their drug as an emergency treatment for heart attacks. Research has shown that it can help improve blood flow through the heart, and when suffering a heart attack, a few minutes can make a difference. "Basically everywhere I go now I’ve got one in my pocket and so I give them to people," he said. Brown is the fourth MP to die during this session of Parliament, including fellow Conservative MP Jim Hillyer who was found dead in his Hill office in 2016 of a heart attack.